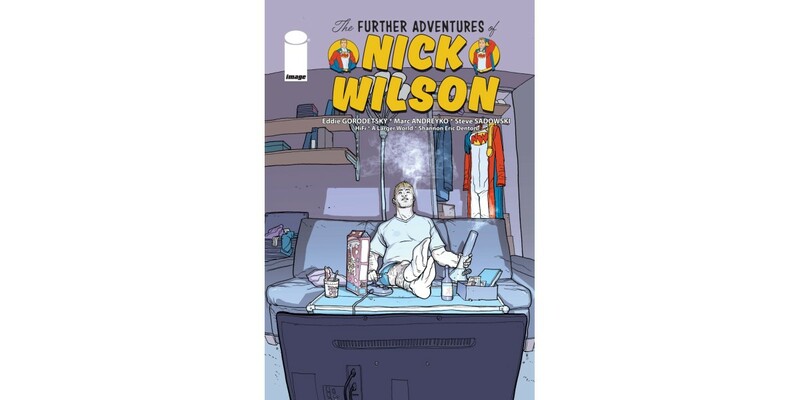 Image Comics will debut THE FURTHER ADVENTURES OF NICK WILSON created by Emmy Award winning writer-producer Eddie Gorodetsky and Eisner Award winning writer Marc Andreyko. Gorodetsky, whose credits include Mom, Big Bang Theory, and Theme Time Radio Hour with Bob Dylan, teamed up with Andreyko whose recent collection Love Is Love united the comics world to raise money and awareness in the wake of the Orlando LGBTQ shootings. Nick Wilson, their first collaboration, is illustrated by comics veterans Steve Sadowski and Ian Churchill. Colored by Hi-Fi Colour Design, lettered by A Larger World Studios, and edited by Shannon Eric Denton with covers by Pete Woods and Ian Churchill. THE FURTHER ADVENTURES OF NICK WILSON is a story for anyone who failed publicly, who didn’t prepare for a second act in their life, who hit a wall and didn’t know how to recover. For a few years in his early 20s, Nick Wilson had super powers and all the acclaim associated with them. When those powers vanished, so did his fame, sending him from national hero to late-night punch line. By the time we pick up his story, he is not yet 30 and barely a name in a trivia contest. Faced with a life in a rear view mirror full of lost powers, faded glory, former enemies, ex-girlfriends, and forgotten grudges, Nick struggles to figure out who he is today. Packing on an extra 20 pounds and peering through a medicinal marijuana haze, he is trying to build a future when all that’s left is just a man who hasn’t been super for a very long time. These are THE FURTHER ADVENTURES OF NICK WILSON. NICK WILSON #1 Cover A by Woods (Diamond Code NOV170648) and Cover B by Churchill (Diamond Code NOV170649) will be available on Wednesday, January 17th. The final order cutoff deadline for comics retailers is Monday, December 18th. Eddie Gorodetsky is an Emmy-award winning writer producer who has written on Two and a Half Men, Batman: The Animated Series, and The Big Bang Theory and co-created the TV series Mom and the radio program Theme Time Radio Hour with Bob Dylan. Marc Andreyko is a New York Times bestselling and Eisner winning writer of Manhunter, Wonder Woman '77, Harley and Ivy Meet Betty and Veronica (with Paul Dini), Torso (with Brian Bendis), The Illegitimates (with Taran Killam) and many more. Andreyko was also the organizer/curator of the best selling Love Is Love—an anthology that raised over $200,000 for victims of the Orlando Pulse Nightclub massacre—and he was the 2017 recipient of the prestigious Bob Clampett Humanitarian Award at the 2017 Eisner Awards. In his career, Andreyko has written for virtually every major comics publisher as well as for film and television.